From 1898 - 1902, Dr W Kington Fyffe was Honorary Pathologist to the hospital. The House Committee minutes of 2/4/1902 record that Dr James Mason offered to act as Honorary Pathologist. A further letter from Dr Mason to the House Committee stated that he was unable to accept the position of Honorary Pathologist, but that he would be willing to assist in some way pending an appointment being made. Dr Charles Munro Hector offered to be Honorary Pathologist in 1903, and his offer was declined. A notice in the Evening Post of 8/3/1904 announced Dr Hector's appointment as Pathologist, Honorary Medical Staff. However, Dr Hector informed the House Committee on 15/4/1903 that he was unable to fill the post. The Hospital Board minutes for April 1910 record the appointment of Dr Walter Kerr-Hislop to the honorary medical staff as Pathologist and Radiologist. Whether he took up this combined posting, and for how long, is unclear. In the early part of the century, any laboratory work required was done at the Government Laboratory in Sydney Street, administered by the Health Department. By 1912, this laboratory no longer met requirements, and a new laboratory was established on the upper floor of a new building erected on the hospital grounds, seen in the photograph. The ground floor of this building was used as a new Outpatient Department, run by the Hospital Board. The Laboratory, however, was under the control of the Health Department, and run by Mr Hurley. He was a self-trained bacteriologist who had spent two years as a medical student in Ireland before leaving the course to pursue his chosen vocation. The visiting Government Pathologist was Dr Hector who reported on any histopathology required. Any autopsies required were carried out by a house surgeon. An Xray tube was in operation at the hospital by 1903, housed in a tool-shed and operated by Dr Ewart. 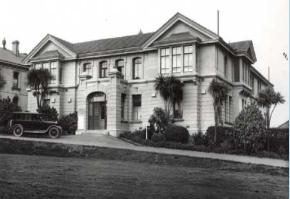 In 1903, Dr Robert A Cameron commenced practice in Wellington and he had his own Xray plant. He gave advice to Dr Ewart on the emerging technology, and in 1906, the hospital purchased new Xray equipment. Dr Cameron was appointed Honorary Radiologist in 1912, by which time the Xray equipment was housed in the old children's ward, this having been vacated when the new Children's Hospital was opened.